I love nothing more than coming into my bedroom to relax for the night with either a book or a series on Netflix or a sneaky game of Tetris on the tablet. I love my bedroom, no matter where I've been in the world, my bedroom at the time has always been my own personal retreat. To me a bedroom is much more than just a room to sleep in. Its a place where I go to unwind from the day, it's a place where I can let go and just relax, where I can put on my favourite pj's and flop down on to my oh so familiar-sometimes-not-the-comfiest pillows. It's a place where the other half and I chat about our day after he comes in from work of an evening, it's a place where many important decisions have been made. I'm also one for not leaving the house until the bed is made, unless I'm in a major rush, it just makes my head that bit clearer knowing my bed is made, strange I know! ( It may also have something to do with my mother always making us do our beds before school and also working in hotel accommodation in my earlier years). After Luke's arrival 19months ago our bedroom became a bit of a free for all, it was a laundry room, a new baby room, a changing area, an eating area, a storage area and sometimes a sleeping area when Luke decided to let us sleep. As he got older it also became a playroom of sorts. He'd pretty much taken over every other room in the house with all of his stuff why not our bedroom too eh?! However our room was given a bit of a lift a couple of months ago with a fresh lick of paint and it seemed to give it a new lease of life. I love the colours in our bedroom, cream and a deep red, so I decided I was going to make it a proper cosy bedroom with some accessories to match the colour scheme but most importantly to bring it back to it's original purpose which was to be a bedroom for us and that only. I was eyeing up the bed covers in Heatons for ages deciding whether or not to get them because really we have more than enough duvet sets but they were on sale in December so I had to. I think they were part of the Christmas stock but they can used all year round. We also got a very cosy duck feather mattress topper from Aldi the other week too. The red canvas picture was actually in a pile of stuff at work that we were giving to the charity shop so I nabbed it for myself. The second picture was Luke's first Father's Day gift to the other half and every time I read the poem it makes me smile. 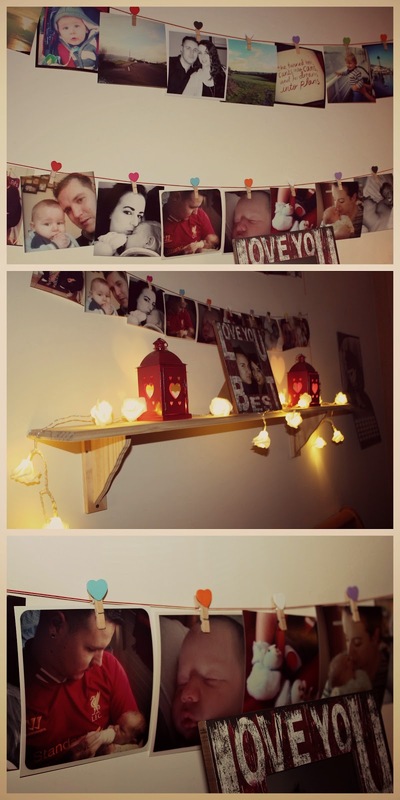 I got some very cute photo pegs with hearts on them from EBay so I ordered some prints of my favourite Instagram pictures from Photobox and decided to make a garland type thing of pictures for above our bed. To hang them I used red string of an old Christmas card holder that I was actually going to throw out. The rose battery operated lights are from Penneys. The red lamp was to replace a really ugly manky cream lamp that was there before, this one is much smaller and neater on the bedside locker and the perfect shade of red to match the walls. I got this in Argos. Next to it is my perpetual Angel calendar, I love flipping it over everyday for a positive message. The photo frame is from Heatons, again the perfect colours to match the paint in the room, the picture was taken a year ago at a friends wedding and it was also the first time we'd left Luke to go away for the night that was further then a couple of miles away (it was Galway in fact!). 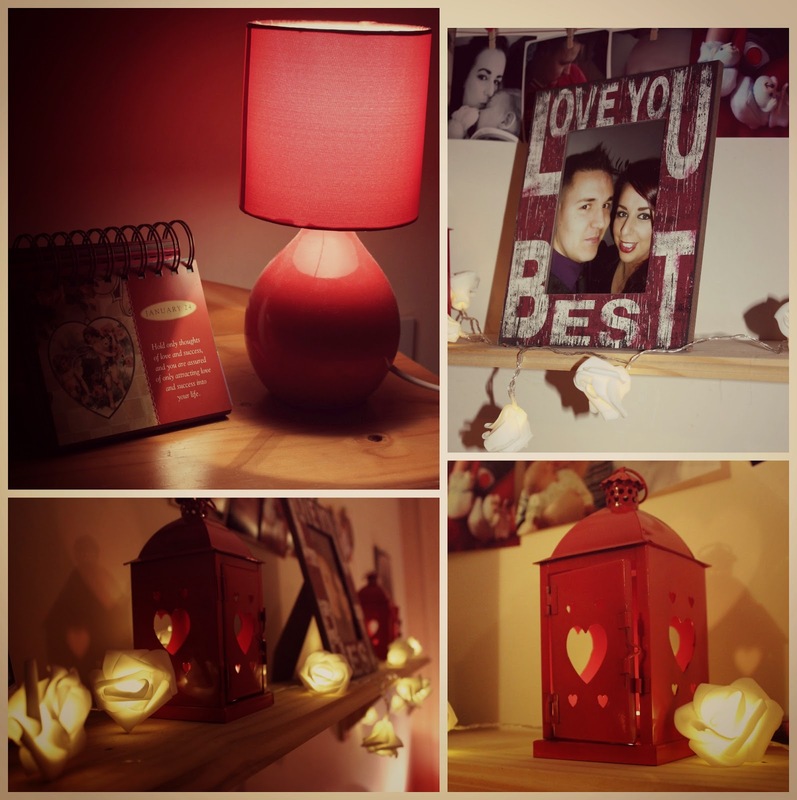 I couldn't believe my luck when I went into Penneys a few weeks ago and saw these adorable red lanterns, I was missing something for the shelf above the bed but these seemed to the perfect thing. I have some lovely vanilla scented candles burning in them at the moment. 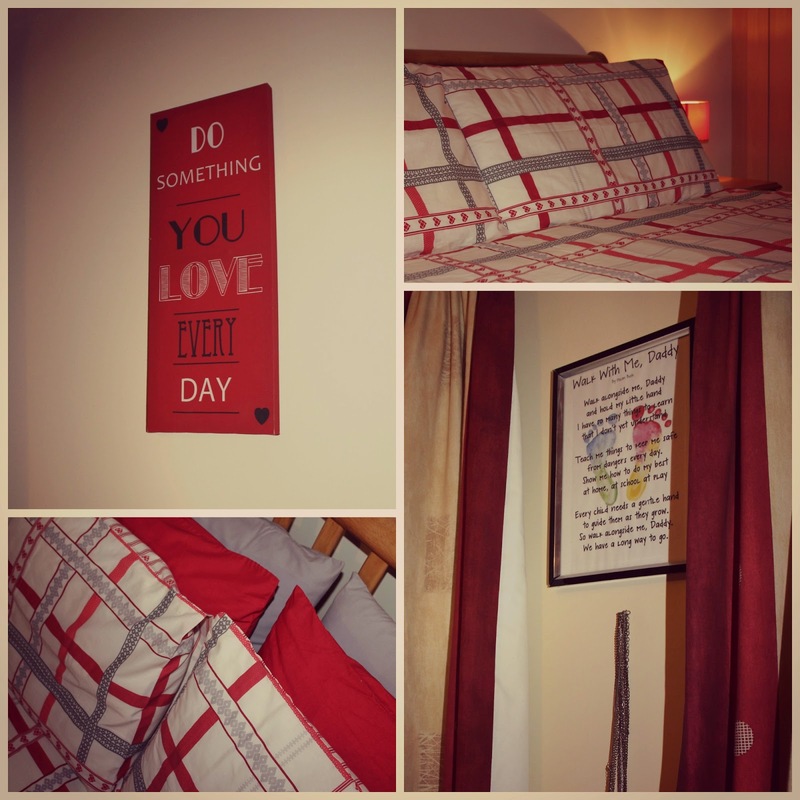 LOVE your room Louise, lots of little touches blending into a really lovely theme. We painted ours last year and I did a huge clear out over Christmas so no more clutter but need to personalise it a bit again, has been neglected over the years. Thanks Naomi :) Ours had really been neglected for about 2 years, it's so nice now to go in there and actually like being in there too! What a lovely room! I started renting my house with my son almost two years ago, and it's still not done! Especially now that my boyfriend moved in, he's always complaining about the floral bedsheets and girly things strewn around. My plan for February is to tackle the bedroom to make it more "ours" instead of "mine", old habits die hard I guess! I try not to make the house too girly but the other half is pretty easy going so he tends to let me just get on with it. Except when I put on a particular bed set - a flowery psychedelic style duvet cover,he always comments on that one! hehe We are the same, move din 2 years ago and have done little bits and pieces every so often.